Did you ever dream of being the chubby red-head kid from the original Willy Wonka and the Chocolate Factory who fell into the chocolate river? Yes? No? Well, I sure as heck did! Chocolate. That word alone can spark a feeling of happiness, joy, love, and euphoria at the mere mention of it. But is it really bad for you? 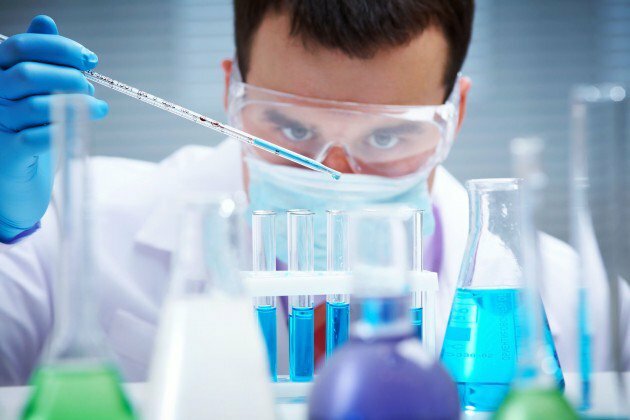 Many scientists and doctors are beginning to think that it benefits us more than we think. One doctor in particular, Rashed Latif, published an article of the health effects of chocolate in the Netherlands Journal of Medicine. In the article Latif says, that there has been a recent biological discovery of active phenolic compounds that are found in cocoa. Latif goes on to suggest that this has initiated research on the effects of aging, as well as oxidative stress, the regulation of blood pressure, and atherosclerosis (Latif). Recently, chocolate has been praised for its abundance of antioxidants. Furthermore, when cocoa is more potent, there are more health benefits and less sugar added to the chocolate which makes it a lot healthier (Nordqvist). 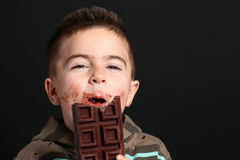 Other POTENTIAL benefits of eating chocolate include: lower cholesterol levels, prevention of memory decline, lowering the risk of heart disease, decreased chances of stroke, helps fetal growth, ability to improve cognitive function, lower risk of diabetes, and potential to better athletic performance (Nordqvist). I am highlighting the word “potential” because (as the article states) the research done on the benefits of chocolate have been conducted in one-off studies. Therefore, to prove that chocolate causes these health benefits, more studies need to be conducted (Nordqvist). On that note, I want to use the information I have just given you to connect to the material we have been discussing in class. When deciphering the truth behind correlation and causation we have been looking for a mechanism within the data (Read). Mechanism is defined by the linking between two things. Having a mechanism defines the cause and verifies the correlation (Read). In class, we looked at the image below. 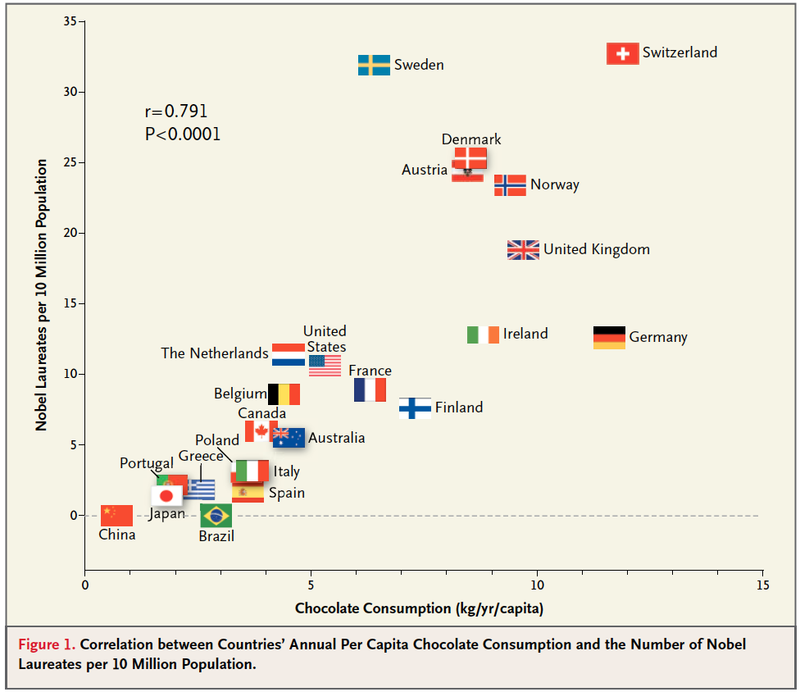 The image showed a direct correlation between amount of chocolate consumed and the number of noble peace prize winners from a certain country. The data showed that the countries that consume more chocolate, have more noble peace prize winners. However, does the amount of chocolate consumed really determine the number of noble peace prize winners from a given country? We have a couple of mechanisms to consider within this data. The reason I am presenting the material above is because we won’t know whether or not chocolate is more beneficial or detrimental to your health until we continue to do more research and find out what mechanism is responsible for the presented results (Read). It may be awhile until we know the true outcome of consuming chocolate, but until then, we can decide whether or not we want to continue to consume chocolate based on all the information presented (Read). Regardless, I know that I will always continue to eat chocolate no matter what! Nordqvist, Joseph. 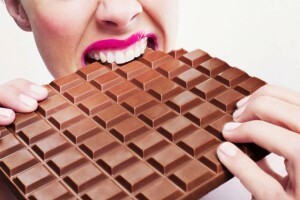 “Chocolate: Health Benefits, Facts, and Research.” Medical News Today. Ed. Natalie Butler. MediLexicon International, 1 June 2016. Web. 07 Sept. 2016. Latif, Rashed. “Chocolate/cocoa and Human Health: A Review.” Netherlands Journal of Medicine 71.2 (2013): 63-68. Web. 7 Sept. 2016. This entry was posted in Uncategorized on September 7, 2016 by Erin Johnson. Hi my name is Erin Johnson and I am from Washington, D.C. Current PSU student, sports and entertainment lover, and Beyonce's biggest fan. I thought your post was really interesting because we often think of chocolate as a guilty pleasure or an unhealthy dessert but it has been proven to have many health benefits. However, I agree with Sean and Kacey’s comments that chocolate cannot be lumped into one category. I found this really helpful article that explains the difference between Cacao—the base of chocolate, which is what is seen to be a superfood and great antioxidant—and chocolate—like a Hershey bar. The difference between these two foods are incredibly important because, according to the article from Natural News, raw cacao is what holds all of the health benefits such as phenylethylamine (PEA), which is a chemical that our nervous system naturally releases when we feel excited, while the chocolate that we normally consume (ex: Hershey bar) has added milk, sugar, vanilla etc. and is very processed so those health benefits are largely gone. It provides a lot of details of the many health benefits attributed to Cacao, and I thought it was really interesting to read. There still doesn’t seem to be enough data to determine whether chocolate is “good” or “bad” for you but I definitely think that drawing the distinction between the different kinds of chocolate helps us to determine where the potential health benefits lie. I am a huge chocolate fan and definitely wish I was the kid from Willy Wonka and the Chocolate Factory at times. It’s interesting to learn all the benefits of eating chocolate. I never knew it lowered cholesterol levels, prevented memory decline, or lowered the risk of heart disease. I was aware, however, that dark chocolate was healthier for you than milk chocolate. Take a look at this article that explains why. According to the article, dark chocolate has less carbs, less sugar, and more fiber than milk chocolate. It is also said to aid in cold prevention has it contains zinc which is good for the immune system. I enjoyed your article, and I also enjoy chocolate as well! Even though chocolate may have certain benefits linked to it, something to remember is that not all chocolate is the same. The obvious two differences are between milk chocolate (think regular Hershey bars or products) and dark chocolate. One key factor between the two is the absence of antioxidants in milk chocolate (made up of roughly only 6% cocoa) that would naturally be available in darker chocolates (those made up of 60% or more cocoa), which is due mainly to the addition of milk during the process itself (http://www.med.umich.edu/umim/food-pyramid/dark_chocolate.html). So next time you remember that chocolate is healthy for you – do not just reach for the closest milk chocolate bar and down it like Agustus Gloop! Instead, look for more cocoa-rich bars or candies to obtain the full benefits that the cocoa bean can provide us with. Good job on the post, and best of luck with the rest of the semester! I really liked your post and I can definitely relate to your love of chocolate. One thing that concerned me however was that your post didn’t touch on different types of chocolate. More and more recently it has been said that the health benefits of chocolate lie in dark chocolate. I think you could have extended your post by including the different types of chocolate like milk, white and dark and discussing their individual health benefits and deciding if one is healthier than the other and if it could be related to the number of nobel peace prize winners. It is very possible that the correlation between nations that eat more chocolate and have more nobel peace prize winners could be due to the fact that they only eat dark chocolate or they only eat milk chocolate and so forth. I think it would be interesting to see if that would have any affect on the results. Here is an article I found that I think you would like that discusses the potential health benefits of consuming dark chocolate over milk chocolate. I am a chocolate girl that loves chocolate! As a young child when taking standardized test my elementary school they would give us chocolate to keep us focused and prepared for our test. I wonder if that really helped stimulate us for the exam? I am the type of person to pick chocolate over vanilla any day and now that there might be health benefits to chocolate just pushed me further towards the chocolate side of this debate. When I read that there are potential health benefits to eating chocolate I was surprised. Chocolate lowering cholesterol levels seems pretty impossible due to the sugar and fat content but maybe these studies are talking about the cocoa beans health benefits. It wouldn’t be that far of a stretch for a plant to have medicinal values but I agree that more research has to be done in this field. Wow, I am also writing my blog post about chocolate too! Us chocolate lovers think the same, eh? My blog post is focusing on the mechanisms and possible confounding variables within a study between chocolate consumption and intelligence. I guess we were both inspired by last class to blog about something we all love! But, the idea that chocolate is “healthy” for us is definitely very appealing. Here’s a post detailing how not all chocolates are made equally- especially when it comes to health benefits. I am a huge chocolate fan and definitely wish I was the kid from Willy Wonka and the Chocolate Factory at times. It’s interesting to learn all the benefits of eating chocolate. I never knew it lowered cholesterol levels, prevented memory decline, or lowered the risk of heart disease. I was aware, however, that dark chocolate was healthier for you than milk chocolate. Take a look at this article that explains why. It says that it has fewer carbs, half the sugar, and four times the fiber. It can also be good for you when you have a cold because dark chocolate contains immune- supporting zinc.